As a third-party vendor, I am exposed to a large number of queries that look at SQL Server metadata – catalog views and Dynamic Management Views (DMVs). These views expose a lot of crucial and useful information about the system, but they can be a double-edged sword, as they are updated frequently and your code must adapt to match. The problem is that, as soon as you start taking advantage of a new column, that query will fail on older versions. Unless you force all of your customers to upgrade to the latest version of SQL Server, you then need to implement some type of branching or conditional logic in your code to run the right form against each version. Still, this has multiple problems. In addition to become largely unreadable spaghetti code, it will be tedious to maintain a library of which columns were added in which release (and a mapping of release to ProductVersion). 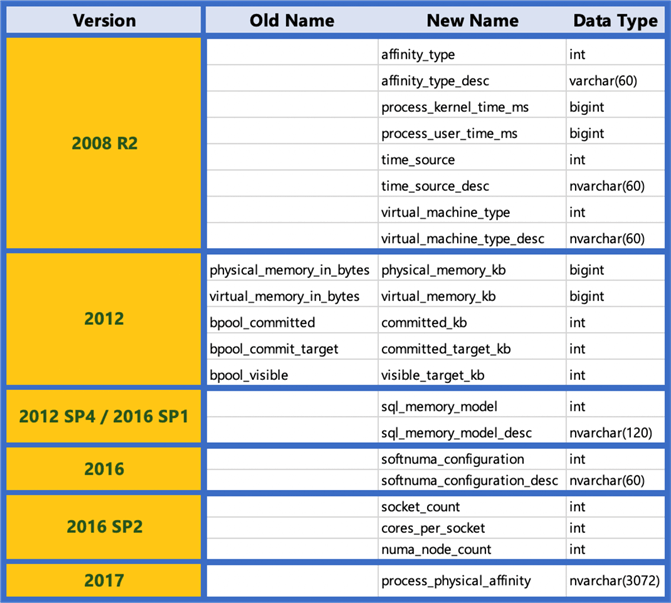 If a column is added in 2019, then back-ported to 2017 CU16 and 2016 SP2 CU12, this logic just became a lot more convoluted, because you'll need full ProductVersion evaluation, as opposed to just the major build number. And this is not really much easier if you avoid stored procedures and generate these as ad hoc queries in your application code; the branching logic will just potentially be in a different language. That works, but it is an equally ugly and unmaintainable mess. Obviously, there is no column named a in TableB. What happens here is SQL Server sees there is no such column at that scope, so it traverses up to the next scope and checks if there is such a column there. This seems like a pretty forgiving aspect of the language, and seems to almost defy the intent of the code as written, but we can capitalize on this. So now our query is forward- and backward-compatible, and we can deploy it to the application ahead of the actual schema change. Now, let's apply this to our DMV query above. …just don't try to qualify the columns inside of m that you have also defined in new_columns, otherwise they will never traverse to the outer scope. That is not pretty to look at, and if ordinal position of the columns is important to your application, you will have to tinker with that as well. For some people, it is arguable that old-school conditional logic and branching will be easier to maintain. In any case, by defining dummy columns up front, these queries will work against any version of SQL Server that has the sql_modules and dm_os_sys_info views (I don't suggest trying them against SQL Server 2000; that's a different problem). I want to thank Martin Smith, Andriy M, and Ypercube for making this solution obvious to me. It is possible, through a little-known property of the SQL language, to make catalog view and DMV queries backward-compatible, and even insulate them from future changes. This may not be the most intuitive approach, and it even violates a best practice that should be used elsewhere ("always properly qualify any column reference"), but for this niche use case it might be the lesser of many evils.